Go SC ziplining on the best canopy tour near the Chattooga River! New– Our canopy tours will now accommodate kids 8 yrs. old and up with a minimum weight of 60 lbs. (1 adult/kid under 12 yrs. old). More than just a zipline, Chattooga Ridge Canopy Tours takes you through multiple ecosystems and into grand old white oak and maple treetops. Our zipline features over ½ mile of air time with 2 sky bridges, 10 ziplines between trees and platforms, 4 zips across Academy Lake, and ends with the 1100 foot Bell Tower Express that launches off our 50 foot tower. Chattooga Ridge Canopy Tours provides two Canopy Rangers for each group to give insight on wildlife and area history while guiding you through the trees. All Canopy Tour Rangers are trained to, and all courses are built and inspected to, ACCT Standards to provide for your well-being and fun. Chattooga Zipline Canopy Tour prices start at $79.00. Flyers must be in good physical condition and able to raise their arms over their head to regulate speed and braking. Please do not participate if you are pregnant, and if you have chronic back or shoulder injuries, you should consult a physician before zipping. Since harness seats wrap around your upper thigh, shoulders and waist, flyers should wear shirts with collars, long shorts or pants. Closed-toed shoes are required. Long hair must be tied back. Cell phones should be left in the car. Zippers enjoy flying over nineteen scenic and historic acres in this full length canopy tour at Wildwater Chattooga. 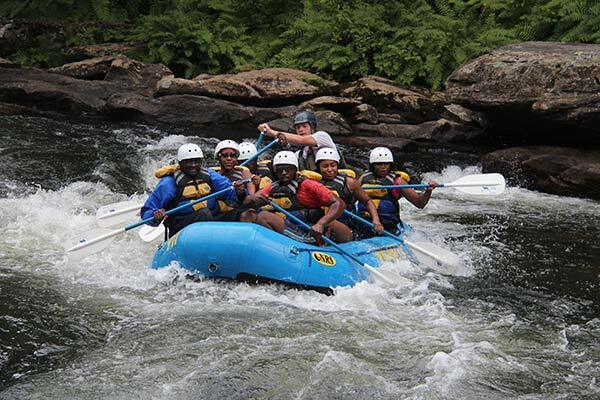 48 Years of Adventures at Wildwater Chattooga!